QUESTION: Mr.Armstong in the past you talked of a down trun in the market in May.Since Trums TAX you have gave the impression everything is ok till 2018 is that correct? ANSWER: There has not appeared to be a condition where one would warn of a crash in the stock market. The decline into May has been more of a sideways consolidation. 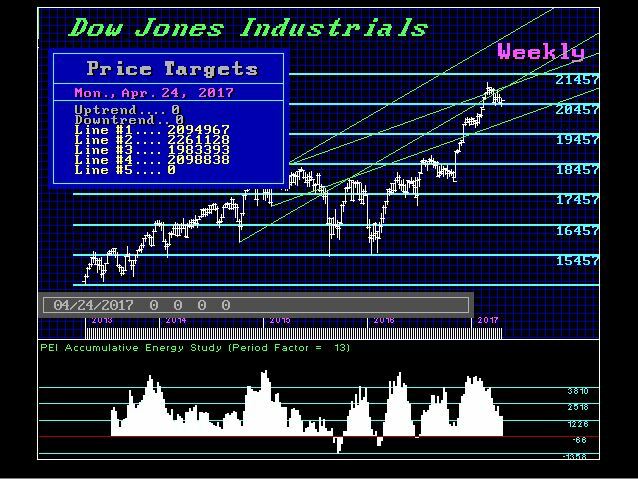 The high remains the week of February 27th, 2017 at the 21169.11 level. In cycle analysis, what you look at is the direction. That forecast would have been wrong if the market made new highs above that of the week of 02/27/17. Moving sideways is still a cycle low rather than a high. The key point was the 20,000 level on the Dow. I have stated that a serious correction would only happen with a weekly closing beneath that level. Today, a Weekly Bullish stands at 20970. We are currently trading at 20954. A close above that level will warn this is starting to firm up. You can see our Energy Models have been declining rather than rising. This has indicated the consolidation and it warns we are not at the precipitous from which a major crash is likely. On the monthly level, here too we see 20975 as the important resistance and 202881 as the support for the close today. Everything is showing this 20770-20975 level as critical. The failure to exceed that level for the close today warns that the consolidation is not yet complete. Last month’s low was 20412.80. A closing below that would be technically bearish and confirm a drop into May. We will lay out the longer term in a more detailed published report.